This band don’t need any introduction. They have been innovating in the death metal scene since 1986 with their dueling dissonant guitar harmonies creating a unique dark & devastating atmosphere. Only a big pile of ash will be remaining of the crowd after NYDM`s own IMMOLATION shreds their ears while mastering the art of death metal. Not too long after, 2011 saw the release of IMMOLATION’s second ever ep entitled “Providence” (Scion A/V). This five song ep of all new original tracks was released by Scion A/V (Toyota) as an online free download, available for fans worldwide. Free cds and vinyl were only available during the band’s U.S tour for this ep, making it an even more sought after release! Overall “Providence” proved again that the combination of Orofino & Ohren, with Par Olofsson once again at the artistic helm, was a team to keep! Production and artwork were once again some of the bands best. “Providence” was not just an ep, it proved to be a five song mammoth that found itself on some of the top release lists for that year! 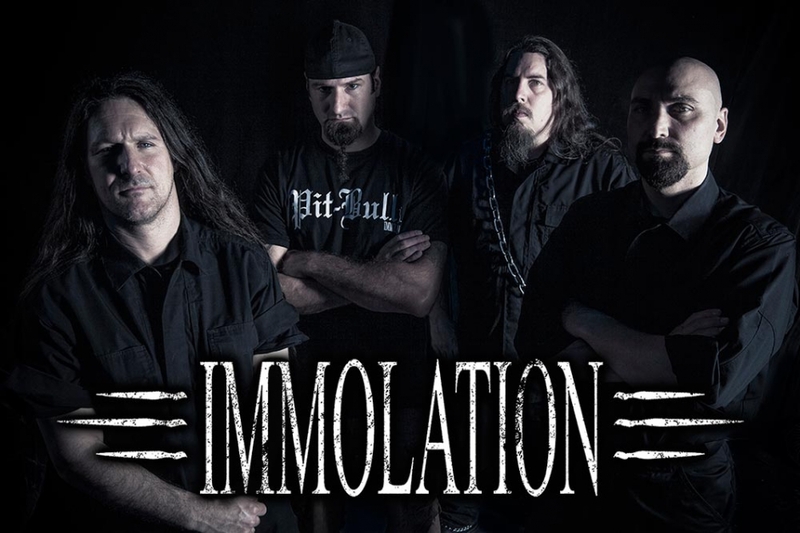 With IMMOLATION creating an interesting collection of avant-garde, yet extremely catchy songs ”Providence” set the tone for where the band was heading, and a taste of what to expect from their next full length lp. “Kingdom of Conspiracy” is truly a defining moment for IMMOLATION. With this, the band’s second full length record for Nuclear Blast, it is clear that IMMOLATION has found themselves at their most refined and strongest point to date. “Kingdom of Conspiracy” is without a doubt their most complete, menacing, and grimmest culmination of musical madness the band has ever released! While conceptually taking a dim and bitter look at the realities of our world today, adding an Orwellian twist to its not so distant future, all our fears are soon realized in this soundtrack that mirrors our world more than we choose to accept. And with speeds and intensity beyond anything the band has recorded, to some of the most mournful orchestrations they have dared to delve into, IMMOLATION has redefined themselves once again, and come out holding the torch high! An unrelenting collection of catchy, intense and darkly imaginative tracks, each song on “Kingdom of Conspiracy” is a testament to the pure style and creativity that makes IMMOLATION who they are! Recorded once again at Millbrook Sound Studios with producer Paul Orofino, mixed and mastered by Zack Ohren (Castle Ultimate Studios), and anointed with the talents of artist Par Olofsson, “Kingdom of Conspiracy” will have extreme music fans foaming at the mouth! With pinpoint accuracy and violent melodic prowess, the epic feel and dominating power delivered by “Kingdom of Conspiracy” is sure to please fans of death/black metal and all extreme music!